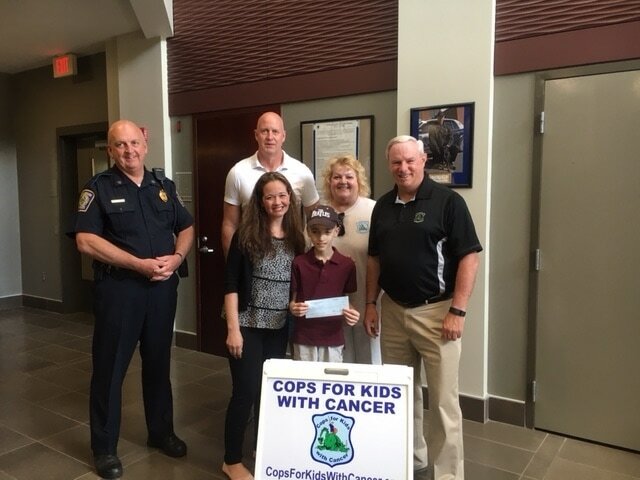 This donation was made on Wednesday , June 28 , 2017 at the Foxboro Police Department. Mike Weir and Maura Flynn, of CFKWC made this donation to Logan Minassian and his Mother Karen. Chief Baker, Sgt. Chamberlin , Karen Ranelli (mom) , Logan, Maura Flynn and Mike Weir. Logan was presented with a Foxboro badge by Chief Baker.